Over the past few years Taiwanese and Hong Kong media have often exposed cases of mainland Chinese children urinating or defecating in public areas. The anger felt in Hong Kong and Taiwan against mainlanders' misbehaviour has even prompted China's Xinhua News Agency to publish "Six Guidelines and Six Taboos", a guide for Chinese tourists travelling outside the mainland. As I have argued in one of my posts, I believe that, although it is right to expose and criticise those individuals who misbehave, it is not acceptable to blame 1.3 billion people for the faults of a few. It is also necessary to try and understand the background of these people. Only a few decades ago, China was a predominantly poor and rural country, and old ways of life may have survived despite the country's recent economic development. Furthermore, it must be noted that in mainland China itself public urination and defecation has led to violent altercations. Admittedly, there seems to be a certain level of acceptance in China towards children who "can't hold" their urine any longer. This has probably to do with education. It can only be changed through public campaigns. A successful example of government-enforced bans of bad behaviour is Singapore, where public spitting has been outlawed (as it is considered a form of littering) as a habit that is not only unhygienic and could spread diseases, but may also hurt other people's sensitivities (see David A. Mackey: Crime Prevention, 2011, p. 393). As habits have changed and are changing in East Asia, so are they in the West, as well. Ross Coomber, professor of sociology at Plymouth University, once stated: "There are reports of people spitting in parliament right up to the end of the 19th century. I like to remind people that we were still building pubs in the 1930s with spitting troughs at the bottom of the bar." Smoking, too, used to be a universal habit tolerated in almost all public areas. Despite frequent complaints about mainlanders' misbehaviour, I must say that I have never witnessed any such case myself when I was in Hong Kong or during my brief stays in Beijing and Shanghai. I must have seen hundreds if not thousands of mainland tourists during my long walks in Central, Admiralty, Tsim Sha Tsui etc., but nothing strange ever happened. However, I have seen people urinating in public in Taiwan. Usually, I just look at them in astonishment and keep on walking. But yesterday, I decided to take a picture of a man who was peeing in the street near Guting MRT Station. I must point out that Guting station is just around the corner, so the man could easily have gone to the toilet there. 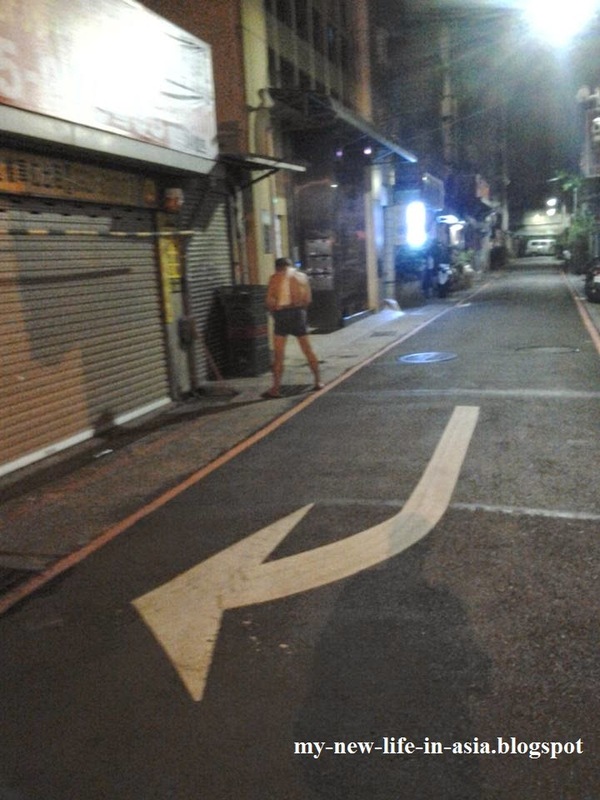 I have seen a total of 4 people urinating in public in Taiwan. A middle-aged woman near Gongguan (she simply squatted in he middle of the street and peed, but no one seemed to take notice); a man at a market near my home; a well-dressed young man who parked his scooter near a traffic light, went up to the wall surrounding the Original Taiwan University College of Medicine and relieved himself; and the aforementioned man. My point is, once again, that it is not possible to judge a whole group of people on the basis of the behaviour of a few. I do not blame 23 million Taiwanese for what these four individuals did. Nor would all Taiwanese blame themselves because of that man on the picture; they'd probably say he's strange.